Sometimes, despite our best intentions, we aren’t able to make payments to our creditors as we had originally planned. This may be due to a variety of reasons, possibly a decrease in income, an increase in housing costs, an unexpected life event, such as a change in family circumstances, or an illness. Whatever the reason for your inability to make your payments as agreed, or to even make any payments at all, you have rights and responsibilities as a consumer who has borrowed money. to say and what to do can often make a big difference. If you fall behind on your payments and fail to contact your creditors, they will start to send you letters asking for, or even demanding payment. They may also contact you by phone. While no one wants to receive these calls and letters, creditors are allowed to contact you to ask for payment and will pursue all avenues to recover any money that you borrowed. Generally speaking, collectors can not call you at all hours of the day and night. They can not keep calling your place of employment to confirm your employment status. Each province has exact rules governing what collectors can and can not do. If you would like to know what applies to your province, please contact a non-profit credit counselling organization for this information. In some provinces, if you ask creditors in writing to communicate with you only in writing, they must do so. This will stop the majority of collection phone calls temporarily. Start by considering what income you do have. Include all of your current sources of income including wages, disability assistance, social assistance, a family member’s or partner’s income, gifts, child tax credits / benefits, pensions, old age security, HST/GST refunds, etc. Consider all of your expenses; weekly, monthly, and seasonal. Include all of your spending – personal, living and household. Our Money Management Basics booklet (budget worksheets, pgs 4 - 5) may be of valuable assistance to you in this process, or feel free to contact us for assistance with determining your budget. 3. Are any of your assets at risk? Next, consider what assets you have that may be at risk. Do you have a bank account at a financial institution that you owe money to? If you get behind with your payments at that financial institution, they may offset money from your bank account or investment product to pay towards your debt. Do you own a home, car or truck, recreational vehicle, vacation property, antiques and collectibles, or stocks / bonds / investments? Some of these may be in jeopardy if you are unable to keep your debt payments up to date. 4. What kind of debts do you have? You also need to consider the nature of your debts: are they joint with anyone? Are they cosigned or guaranteed by a family member or friend? Are they secured by real estate or property? Depending on the nature of your debts, your inability to pay may affect a family member or friend or a creditor may want to collect on their security. Each province has laws around seizure of property – please feel free to contact us if you would like to know whom to contact in your area for clarification about these laws. Once you’ve completed the 4 steps outlined above, you are now ready to communicate with your creditors in writing. However, before you write your creditors a letter or an email, contact us for information about how to clarify the statute of limitation in your province. You need to provide enough information so that your creditors understand your financial difficulty, and that while you would like to pay them, currently you are not able to do so. It is also important to include information outlining what you intend to do going forward. Also prepare a summary of your budget stating how many people reside in your household and how many dependents you have. Include your total income, your housing and transportation expenses, debt obligations, medical expenses, grocery and personal expenses, as well as taxes that you need to pay. Don’t forget to include a monthly estimate of your necessary seasonal expenses. Contact us for information about how to clarify how written acknowledgement of a debt impacts the statute of limitation in your province. Now it may be time to prepare a letter (see sample letters and important note at the bottom of this page). 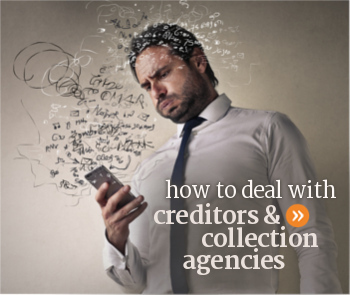 Make a list of the address, phone and fax number for each creditor or collection agency. Be sure to obtain the name of the person / supervisor you have been dealing with at each company. Confirm which debt they are trying to collect on to make sure that two agencies aren’t trying to collect on the same debt. You want to communicate in writing with your creditors so that you can explain your situation to them and ask them to only communicate with you in writing as well. This will stop the collection phone calls, providing you follow through with whatever you have proposed in your letter. You will also need to respond to their letters. For example, you stated in your letter that your family income has suddenly decreased because your partner is off work due to injury. You also explained that there is an insurance payment expected in 3 weeks and that you will make your debt payment then. Make sure you follow through with your payment. If it takes longer to receive the insurance payment, write them and tell them so. Your goal is to gain your creditors’ co-operation during your difficult time. Communicating honestly and updating your creditors about your situation is very important in this process. If you’ve written a short letter to outline your situation, attach any relevant documentation and the summary of your budget. Then email, fax or mail it to your creditors or collection agents by registered mail. You want proof that they received it. Get proof every time you mail or fax anything to them and keep your receipts organized. If you speak with someone to give them an update about your situation, jot down their name, number, time of call and what was discussed. You may need to provide these documents and receipts again in the future. Follow up oral communication with something in writing if possible (see note below regarding writing to your creditors). If the person you were talking to proposed a payment arrangement or special circumstances, ask them to send it to you in writing. Verbal agreements are difficult to prove. You can take the time to consider a written offer more carefully than if you are on the phone with someone. It’s important to only agree to what you are reasonably able to do – don’t get caught up in the heat of the moment. Lastly, remember that a non-profit credit counselling service in your area would likely be happy to answer your questions and provide assistance or more information. A non-profit Credit & Debt Counsellor can guide you through the process outlined above as well as explore other options to resolve your debt problems. Get help now and stop the collection calls. See: Sample letter "reduced payment"
See: Sample letter "no ability to make payment"
See: Sample letter "forgiveness of debt"